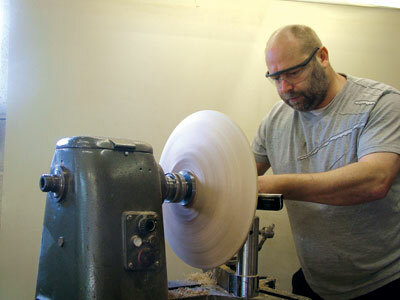 Initially, I was a little apprehensive as this is a collet chuck and in my early days of woodturning I recall struggling to place an elastic band around the jaws whilst still keeping them in place. However, all went well. 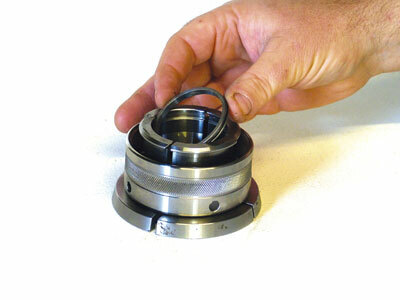 From the moment of opening the box, I immediately felt that the chuck was extremely well manufactured and nicely finished, with all sharp edges from machining removed. The chuck body comes complete with a 24-point indexing facility and I appreciated the clear instructions which came with diagrams showing step-by- step procedures for inserting the jaws. I was very pleasantly surprised at how easy this was and didn't experience any of the trouble I remembered from before. The ease of putting the jaws together is due to the metal 'O' ring which holds the jaws in place - something my collet chuck didn't have. I used the chuck grips accurately and securely both in compression and expansion modes, turning a 406mm (16in) diameter platter using the DJ90 jaws on a 75mm (3in) spigot. 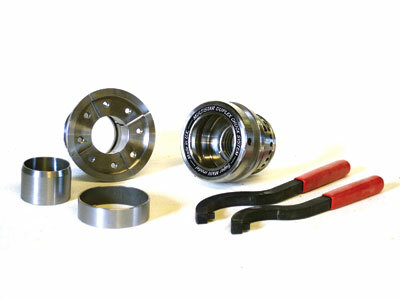 These cleverly designed jaws not only allow the spigot sizes to be used but can also be used in expansion mode by making use of the expansion plug and ring that are supplied with the chuck. Six different sized steel jaws are available, including an 18mm (3/4in) spigot and 25 mm (1in) recess up to 75mm (3in) spigot and 90mm (3in) recess. In addition the two largest sized jaws are machined to accept a 38mm (1 1/2in) parallel spigot. The largest jaw set - the DJ90 - also has 2 M6 threaded holes in each jaw to enable home-made extension plates to be secured to them, making for a very versatile piece of kit. The Duplex has dispelled my previous thoughts about collet chucks and I would be very happy to continue to use this one. Not only is it well made, easy to use, versatile and very accurate, it also comes with a two-year guarantee and therefore I believe it represents good value for money. "I believe it represents good value money"